A total of 139 former council tenants bought their homes under Right to Buy and resold them within one month, the BBC found. Those resold homes created a ? ?2.8m collective profit. Opponents of the scheme said too many people had profited from a policy that had "much bigger social ambitions". Supporters said Right to Buy helped people climb the housing ladder and secure their families' financial futures. The former tenants were allowed to buy their homes at prices below the market rate. However, those who sell within five years of purchasing, should have to pay back some or all of the discount they received. Repaid discounts, which are calculated on a sliding scale depending how long the purchaser kept their home, were not included in data the BBC obtained on 92,000 sales across the UK. The Chartered Institute of Housing (CIH) said it was "shocking to see the extent of the profit margin in black and white". It called for Right to Buy to be suspended in England. In January it was halted in Wales, as it was in Scotland in 2016. Housing commentator Henry Pryor said: "Far too many... simply profited from a scheme that had much bigger social ambitions." The BBC's Shared Data Unit obtained and analysed data from HM Land Registry, the Registers of Scotland and the Northern Ireland Housing Executive. Data for 92,000 sales was published in Freedom of Information responses. The investigation found homes in Britain bought under the scheme had been sold on for ? ?6.4bn in collective profit since 2000. Jane Thorp bought her Brighton flat leasehold under Right to Buy in 1993 for ? ?15,000 after she had been a tenant there for seven years. The grandmother of one said it was "quite desirable for a council estate near the sea". The former HR manager pays a monthly service charge to her council for repairs to her block and said she was sometimes charged "a huge bill" for major works such as new wall insulation. "I think we have five non-resident landlords [who bought ex-Right to Buy homes] in this block. They're not rich people, they're just looking for a bit of income for their retirement. "I wouldn't have been able to buy without Right to Buy. I was lucky, I still have equity. Some people are stuck there in perpetuity, because you can't downsize from a council flat." Kerry Devlin is buying the housing association home in Thrapston, Northamptonshire, where she has lived for 20 years - at a 50% discount. The care home assistant manager originally moved there as a single parent and has since married. The mother of one, aged 48, said: "It's a way of securing our future. Otherwise [If I didn't have this discount] I would be pushed to my absolute [financial] limits." "It's just a shame more young people cannot go on this scheme. It would give them a huge step up because they're struggling to get on the housing ladder. "I'm fortunate this opportunity has arisen." Lola Hutcheson is in emergency temporary accommodation in Fishponds, Bristol, after being evicted when she was not working in December. Now working as a locum for a charity to tackle rough sleeping, the 39-year-old said: "It's quite stressful. "We're lucky we haven't been moved more than once. "I visit the HomeChoice website every week where they rent social homes and there are three or four each week. "There are regularly 100 people in the queue bidding before me and I cannot see how many there are after me." Since October 1980, council tenants have been able to buy their homes at a discount, which now stands at a maximum of 70% - depending on the length of the tenancy - or ? ?80,900 across England and ? ?108,000 in London boroughs (whichever is lower). Then-Prime Minister Margaret Thatcher said it would pave the way for a "property-owning democracy". 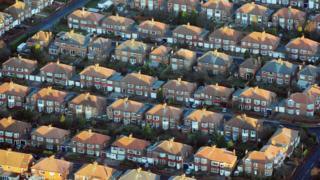 Some 2.6 million council homes have been sold in Great Britain since the policy came into effect. Former tenants who sold within the first 10 years of buying homes had to offer their council the chance to buy back the property first, the government highlighted. Across the UK, the devolved governments have adopted differing approaches to the policy in recent years. Between 2000 and 2018, some 53,000 homeowners made ? ?5bn in profit, or ? ?4.3bn in real terms. About one in 20 made a loss in real terms. Twenty people bought and sold their RtB home again within one week. In England, the policy has been extended for housing association tenants to buy their homes at a discount in a few pilot areas. A final cut-off date for applications to buy under the policy across Wales expired on 26 January. Homeowners from 39,000 sales we analysed made ? ?2.3bn in profit or ? ?2.05bn in real terms. Some one in 50 sellers made a real terms loss. The average time someone kept their RtB home before selling it on was about five years and eight months. Seventeen people bought and sold their RtB house within one week, three of those did so on the same day - one at a ? ?60,700 mark-up. The scheme was brought to an end in Scotland in 2016, a move Shelter Scotland greeted with a "welcome obituary". Northern Ireland does not record sales prices. Between 1982 and 2018, some 120,950 former social homes were sold including 500 homes with five or more bedrooms. A consultation on the future of House Sales Schemes, the equivalent of RtB in Northern Ireland, was launched in 2018. Polly Neate, chief executive of Shelter, said the scheme had "stored up serious trouble for the future". "We're still building far fewer homes than we're selling off", she said. Paul Dossett, head of local government at financial services firm Grant Thornton UK LLP, said the policy had been a "disaster for the UK taxpayer". The policy was "unsustainable" and he backed calls for councils to keep much more money from house sales, he said. Labour's housing spokesman on the London Assembly, Tom Copley AM, said he "wouldn't begrudge anyone taking a decision in their own financial best interests" but RtB's legacy was "a massive transfer of wealth from the many to the few". Kate Henderson, Chief Executive of the National Housing Federation, said it was working with ministers to develop "safeguards to stop the loss of social housing" by insisting on the replacement of a new affordable home for every property sold. Lord Heseltine, who was the Secretary of State for the Environment when the policy was introduced, declined to answer questions about its impact. England's Minister of State for Housing Kit Malthouse MP said the policy had helped people "achieve their dream of home ownership". The Shared Data Unit makes data journalism available to news organisations across the media industry, as part of a partnership between the BBC and the News Media Association. For more information on methodology, click here. For the full dataset, click here. Read more about the Local News Partnerships here.